At Cochell Family Dentistry, our goal is to have the best of both worlds. We offer old-school, family-friendly service and also have a dental office that uses some of the latest, most state-of-the-art technology. With the tools and services detailed below, we’re able to make our dental patient experience faster and more comfortable than ever. That way, everyone who visits us can spend less time in the dental office and more time simply enjoying their healthy smiles! To come enjoy the very best that dentistry has to offer, give us a call today. TMJ stands for temporomandibular joint, and it’s a very important body part that has a very long name! This is the joint that connects your lower jaw to your head, and like other joints in the body, it can sometimes develop issues due to strain, injury, arthritis, or even teeth grinding. This can lead to problems such as a stiff and sore jaw, chronic headaches, and even pain in the shoulders and neck. Our dentists are able to find, diagnose, and treat these kinds of issues right here in Salem, so be sure to give us a call if any of these symptoms sound familiar. Does just mentioning the word “dentist” make the hair on the back of your neck stand up? Does telling your child they have a dental appointment coming up always make them upset? We’re able to calm all varieties of dental nerves thanks to anxiety reduction dentistry. 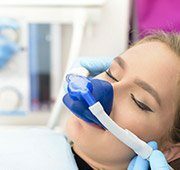 Using either tried and true nitrous oxide (laughing gas) or a pill you take before your appointment, we can help even the most nervous patient have a smooth and relaxing dental experience. 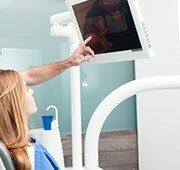 Dental camera technology allows not only our dentists to get a better look at your teeth and gums, but you as well! 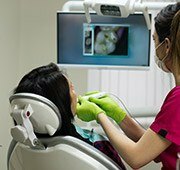 Using our Dexis intraoral and Nikon extraoral cameras, we can create highly-detailed images of your mouth that are instantly displayed on a nearby monitor. You’ll finally get to see things from your dentist’s perspective, giving you a whole new understanding of your dental health. These images also make it much easier for our dentists to explain your needs and why you might require certain treatments. 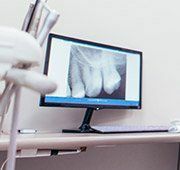 X-rays help our team catch many dental problems even before they are visible to the naked eye, and thanks to the advent of digital technology, this tool is now faster and safer than ever. Digital X-rays can create images in just a fraction of the time needed by traditional film-based X-rays, plus they cut down on radiation exposure by up to 70%! 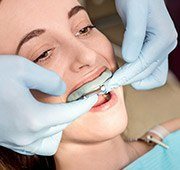 We can even use them to generate a panoramic view of your mouth so we can see all of your teeth in the same image, enabling us to better plan a wide variety of complex treatments.